Skuret is a tiny bar in Oslo used a lot by those who study various instruments or musical related stuff at NISS (Nordisk Institutt for Scene og Studio), since they get to play there either for free or for very little money and practice their compositions in front of the crowd. Thus, any concert held there should not raise anyone's expectations to some bombastic show since there's simply no room for that. The scene can force bands with too many members to face each other, instead of the crowd, so they avoid a guitar/bass neck punch in the face. That is why, on one hand, I personally love the place for the cozy feeling of such 'intimate' concerts and for the fact that you actually get to see the display of skills and talents required to make your music sound really good in a place with maybe limited technical possibilities than a big concert dedicated scene. And on the other hand I feel sorry for not seeing the 'complete' performance as it would be on a bigger surface. Skills and skilled people is pretty much what Saturday evening brought on the scene. After passing by earlier the day and found out the first band goes on stage at 10, our guests from Finland, my flatmates and me relocated to the bar about 20:30. We had to wait a bit longer though, until about 11, not that this was a problem at all since you either run into band members and can chat with them about this and that or just sit at the table and set new standards for multicultural silliness. After some sound checks, the guys from Wintergrave finally take their places on stage and if I got familiar enough with the song, they kick start with their impressive song "Scattered Mind". The name Wintergrave might make you think you'd experience some pathetic tragical music filled of dark, sad moods, vampires&co. How wrong you'd be. The young band (formed in 2006 and with only one EP released so far, "Final Termination") pours into your ears a mix of black metal (think Emperor or the orchestral Dimmu), thrash bits and very melodic keyboard tunes. All of them backing up an incredible and intense vocal performance that keeps them in the range of black metal and makes you think in terms of 'Wooow', everytime the young singer starts growling. Their songs are hardly 'static' in the terms of repeating the classical verses-chorus-verses. Every few minutes they attempt something new and then return to the main pattern for a little while, maybe making the music too hard to digest at a first hearing since you forgot where it all started. But as long as you keep in mind that the songs you're hearing only come from a debut demo and the upcoming album, you are quite certain they are going to learn quite quick how to refine their music. It was quite sad that Wintergrave stopped playing, since I really enjoyed their performance. But knowing there's one great treat in tonight's program, I got over it quickly. 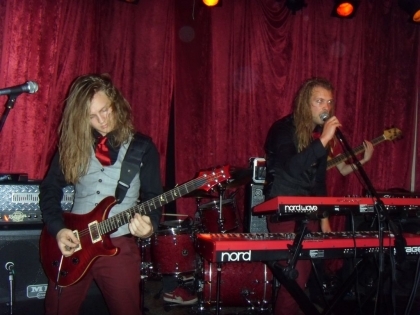 After setting up the instruments on stage, few more sound adjustments, the guys from Leprous came on stage dressed in their classic by now 'uniforms' based on a mix of black and red as colors and fancy accessories with regular clothes. I was surprised to see the amount of people gathered in front of the stage (for a place like Skuret, that is) and they kicked in with a tune from the soon-to-be-recorded album. And altogether I think they have actually played 4 songs from this album, 2 of which were totally new to me and make me wish the album would be released like yesterday, since it sounds so promising, with shorter and very melodic songs. So far, the band has released a Demo album, 'Aeolia' and a full length one, 'Tall Poppy Syndrome'. From the reviews I read and from my own personal impression, the latter is an incredible musical composition. The band is very daring when it comes to their music, yet very serious and professional. They put together a lot of progressive elements that end up sounding very bold and original. There is no time for dullness or for moments that you feel you'd skip in their songs, waiting for that good guitar solo at minute X. I can't make up my mind if there's anything in particular that stands out in their music, or it's the music altogether that stands out. In order for me to get hooked up by a band is to like the voice. There's no doubt that Einar Solberg's voice managed to do that (and it's worth mentioning he has been playing keyboards and backing vocals in Emperor since 2005). He can nicely switch between very melodic passages to intense growling, all of them while he skillfully tweaks his keyboard buttons for finding the right tune in each moment. Then you have guitars. Who, always elegantly, either work together to increase the intensity of a solo or a moment in the song, or one of them keeps a steady tight rhythm while the other dwells into a restless riff, but never insisting long enough to give you the feeling of useless showing off. All is played mainly on 8 chords, since the band has had the experience of backing Ihsahn and that has really helped improving their mastery when it comes to extra strings on their instruments. Then there is Halvor Strand's bass and there are Tobias Ørnes Andersen's drums. They work so well together at accentuating the rhythms of their songs and live is quite delightful to watch both of them, since they play with a lot of passion and efficiency, creating a perfect symbiosis. None of the components of the drumkit gets any rest at all time, as the drums are accurately reinvented - compared to the album version -to keep the intensity of the songs yet, managing to add a lot of cool spices into them. Besides, they don't want to stand out thus ruining the overall feeling of perfectly blended instruments. The above comments are both for the music on the album and for the live performance, especially this one that was a final rehearsal before their tour. I have had the luck to see them many times live, either as backing band for Ihsahn or with their own shows. I think the serious manner in which they treat their work is very obvious as their appearance on stage has greatly improved, making them very captivating for those who haven't heard or seen them before. They play tight music with a lot of personality and much more relaxed attitude (read confidence) than the first time I saw them. They will soon start touring Europe as support band for Therion and I strongly recommend to anyone going to those shows not to dare to miss their act. It will show you how young people have found the courage to bring fresh music in the old by now world of progressive and how perseverence and seriousness blend together makes you an artist able to quickly impress the audience. For Romanian fans, they will play on 22nd of November at Arenele Romane, so do your best to be there!